One of the great things about working in a Guitar Shop is some of the interesting "discoveries" that just walk in through the door. This page is dedicated to those interesting guitars and guitar subjects that may not get much play elsewhere. If there is something you would like to see, or have a guitar or guitar oddity you'd like others to see, please email us! A few weeks ago Tommy sent me an email telling me he had some vintage guitars from a major collection in his shop. So my friend Klaus and I went there to have a look. He showed us a 1952 Goldtop, a 1953 Telecaster, a 1958 Stratocaster and 1956 Goldtop. 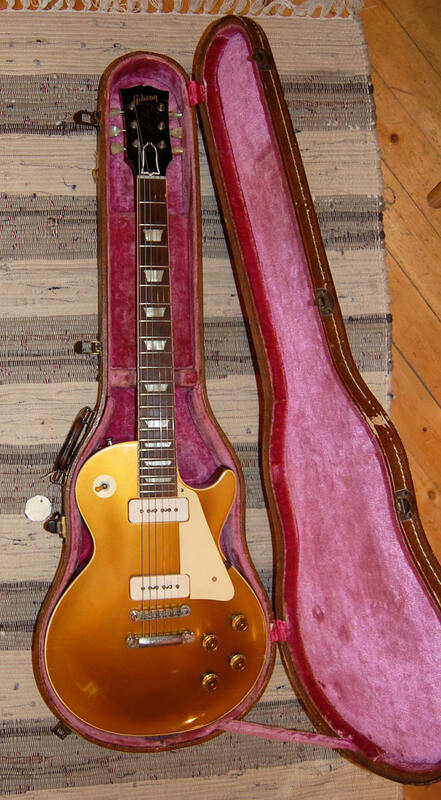 I immediately fell in love with the 1956 Les Paul Goldtop. After one week of thinking it over and over again and my sons telling me that I had to buy it I finally bought it. 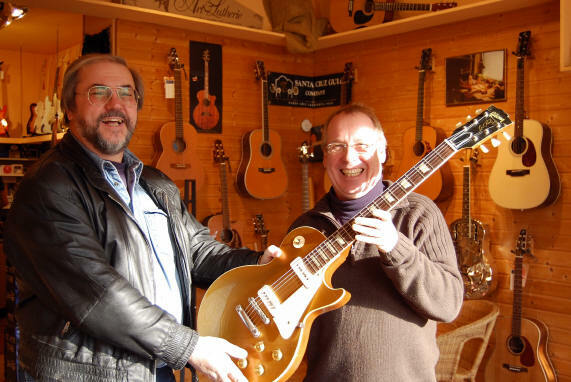 Attached you'll find a photo of Tommy presenting me the Goldtop. It is almost original except the top which was refinished by Tom Murphy. That's why I could afford it! Klaus and I compared the color of the top with the one of the1952 which is the original one and we could not find any difference. The color of the 1956 is the same like the one on my 1957 Tom Murphy Goldtop of 2000. In 2010, regular readers and posters on the GuitarAttack Forum responded to a challenge. It went like this send -- send our friend Eddie Wellman your extra and/or unwanted guitar parts, and he'll build a cool guitar and post the progress on the Forum. Well, this is it. It is a tribute to GuitarAttack, and we couldn't be prouder of the story and the guitar. Thanks for the great contributions out there, and we hope you are all inspired! PLEASE RISE FOR THE STRAT! The GuitarAttack Crew headed to Tennessee over the Christmas holidays of 2004 to visit family and friends. We visited a friend in Nashville who has a very cool studio and has been kind enough to let us record there a number of times. 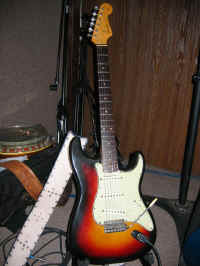 We walked in and were not quite ready for what we saw -- an original 1963 Strat! Bought by a friend's father in 1963, this is an all original specimen. We originally thought this was a Relic reissue, but when the story came out, we about fainted. A fabulous playing and sounding guitar! Be extremely careful what you buy on eBay! The GuitarAttack Crew took a trip to Memphis after the grande finale NAMM 2004 in Nashville. We had a great trip and heard some great music, but what made the trip was a pilgrimage to Graceland, home of Elvis Presley. There are lots of guitars around Graceland, but this was by far the coolest. 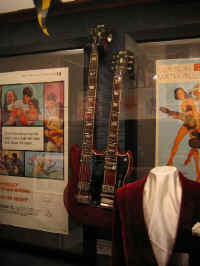 A doubleneck SG with a six-string bass on top and six-string guitar on the bottom. This guitar appeared in Elvis' 1966 movie Spinout, as did a bunch of hotties like Shelley Fabares...and some very cool Shelby Cobras! Take a trip to Memphis if you get the chance! Mr. Bill Lester at the ReRanch recently started offering a 3 Color Sunburst Kit aimed at Fenders and their clones. Well...how about a Les Paul? 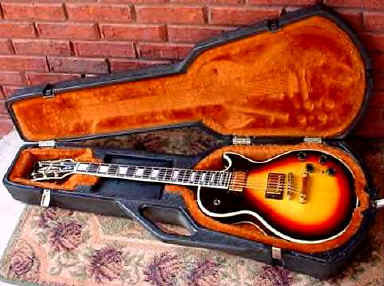 Here is a 1979 Les Paul Custom with a Fender-like sunburst from the factory. I've never personally seen one of these -- this photo came from the Internet. I recently saw a new Custom Shop Les Paul Custom with a finish similar to this one. It had a "killer top", and the sunburst was very, very attractive. 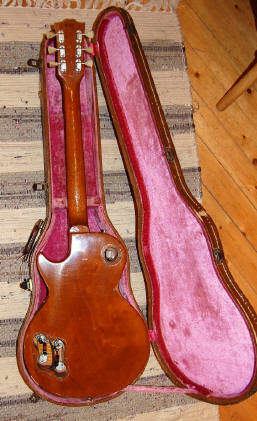 It was very similar to this one -- of course, the new Les Paul was supposed to have been "one of a kind." Again, keep looking in those closets, guitar collectors! From Ken at KK's Music comes this great St. Blues guitar. Built by Strings n' Things in Memphis, this is a Tele/Strat-like axe from the 1980's. It has a bolt-on maple neck with a Rosewood fingerboard, a double-bound body (alder or basswood -- not too sure), and a Strat pickup scheme with Tele-like controls. 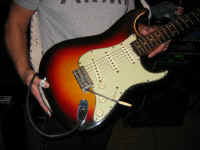 We had the opportunity to complete a setup and rewiring on this guitar. 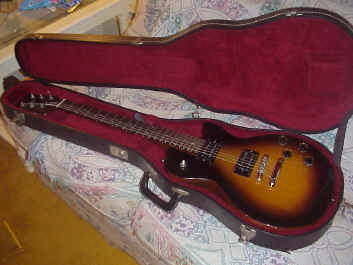 It is a fine instrument equipped with Duncan pickups and Fender hardware. I almost made an offer on it because it played and sounded so great. We'd like to hear from any St. Blues owners out there! This is a 1979 Gibson GK-55 I recently saw on eBay. What is interesting about this instrument is that it was a short-lived mod to one of my favorites, the Les Paul '55. What you have here is a Les Paul '55 with no pickguard and two humbuckers in place of the P-90s. This guitar did not sell at auction -- the max bid at the end of auction was less than $500. I recommend buying one of these if you see one. Update: I got an email from the gentleman who bought this guitar. He did the research with Gibson and confirmed that this rig is basically a Les Paul '55 with humbuckers, built with leftover parts and a bolt-on neck instead of set. That's the "55" part of the name...the GK stands for "Guitar Kalamazoo", to differentiate it from their regular Les Paul lineup.